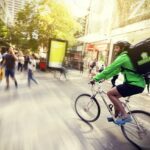 Recent court cases in Australia and Spain have cast doubt on the long term viability on the Gig economy food delivery business model. Smart Company is now questioning whether UberEats and Deliveroo will be able to continue in Australia, but the bigger question is whether Gig economy delivery is a broken business model. It is becoming increasingly common for courts to view the riders as employees, despite the desperate attempts of the delivery aggregators having them classified as independent contractors. Increasing legal risks for the Gig economy operators. UK courts ruled that Deliveroo have denied the human rights of their riders to collective bargaining. Foodora lost an unfair dismissal case in Australia and was ordered to pay a rider $16,000. Deliveroo riders are to be treated as employees as determined by a Spanish court, which could set an important precedent in the European Union. All of this comes after it was found that Foodora riders are employees and had been underpaid before Foodora went into administration and left Australia. 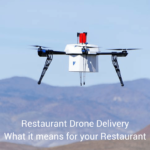 If this growing trends continues, it could deny the aggregators the ability to use workers to deliver their food at a cost competitive price, decreasing the demand and decreasing the value of the network effect. Traditionally Restaurants have picked up the excess demand by having front of house staff deliver food at peak times, but the delivery aggregators have tried to remove that hassle by offering to do the delivery. The price, often commissions as high as 35%, has undermined profitability for many restaurants and there is a growing trend for Restaurants to want to retain the customer contact details. Aggregators do not share email addresses of the customers, so it is very hard to drive demand as a Restaurant. The growing disenchantment with the model from the Restaurants point of view, increased concerns around quality control and food safety and the risk of legal action is putting increased stress on the business model. Further court action could create a situation whereby countries are no longer viable for delivery aggregators. How will this effect Just Eat / Menulog? Menulog in Australia is just starting to ramp up the delivery side of their business and Just Eat is looking to compete better with Deliveroo and UberEats by providing not only online orders. The problem for Just Eat is that the original business model was very profitable, taking orders and collecting 13% commission for very little work. The provision of delivery services is much more complicated and a lot lower margin. Menulog in Australia has the benefit of hindsight in regards to seeing some of the legal issues that Deliveroo, Foodora and UberEats have faced with their contracts, but it remains to be seen as to whether they are able to quarantine the issues with workers pay and conditions from what has happened with the other delivery aggregators. 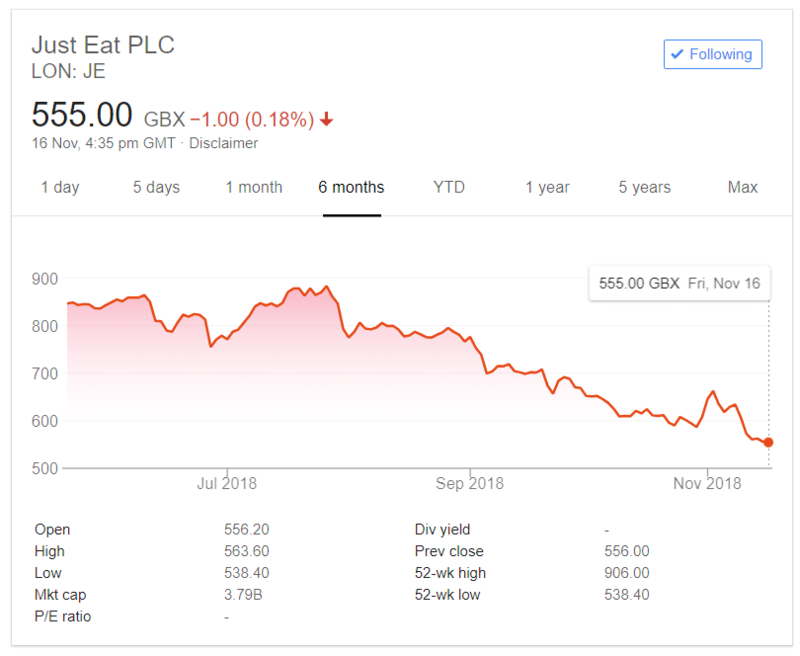 Over the last 4 months, the Just Eat share price has collapsed 40.6%. What could have wiped of Billions of market cap? The Just Eat share price has been hammered over the last 4 months and has dropped 40.6%, wiping out over $2,000,000,000 in shareholder wealth. The reason for this may be concerns about the migration to a less profitable business model and the twin risks of being out manoeuvred by Deliveroo and UberEats with delivery at the same time as facing the same legal risks in employing delivery riders. We believe that Just Eat is in the worst position of the 3 big companies, with too little, too late as far as offering delivery. What are the goals of the Deliveroo, UberEats and Just Eat? We believe that each company has their own endgame in mind. Just Eat – trying to play catch up with delivery services in an effort to retain market share. This may be very difficult given the lead that the other companies have, although they do have a very large number of Restaurants working with them for orders. The challenge will be to scale up the number of delivery customers and riders to be competitive and profitable. Deliveroo – The focus is to decrease the business that goes through Restaurants by increasing the prevalence of their ‘Dark Kitchens’. We think that once they have the dark kitchens working well, they will start replacing chefs with their own staff, possibly in a Gig Economy type of arrangement. By not paying retail prices for the lease and being able to cook 10 cuisines out of the one location, they will be able to decrease costs and make traditional restaurants unprofitable. We believe that they have missed the big point about why people go out to Restaurants. It is not just about the food. UberEats – Automatic delivery of the food is the end game for UberEats. Uber is already heavily invested in self driving car technology and the ability to deliber without paying for the driving could make the delivery game cost competitive. They can then do away with the need to have ‘independent contractors’ as a part of the business model. The question of survability comes down to how much money is in the coffers and how quickly each company is buring through it. Just Eat has been profitable with ordering only, but could experience vastly higher costs as it attempts to muscle in on the 2 delivery leaders. We believe that the next 6 months could be pivotal in the future of these companies. The decreasing share price of Just Eat may restrict the ability of Deliveroo and UberEats to raise further capital and would see a trade sale become a necessity in order for the businesses to survive. We spoke recently to a FROLO customer who had taken over $200,000 in online orders, saved $26,000 in Menulog commission and most importantly, collected over 1,000 email address from loyal customers. 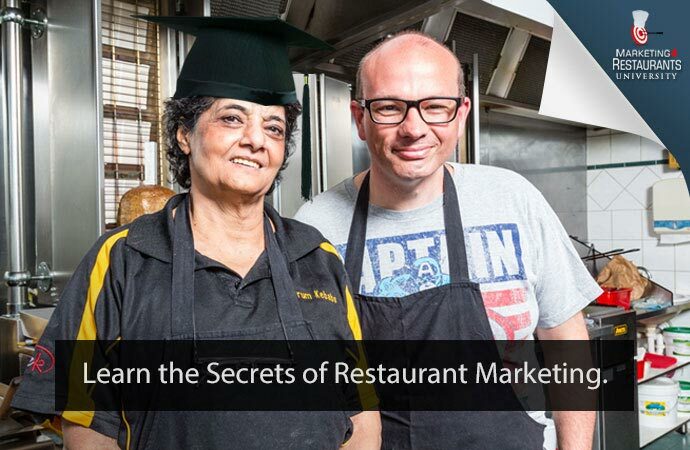 This makes a massive increase in the profitability of a local Restaurant. He has been able to sue some of those savings to fund his own marketing campaigns, building his brand and increasing his profits even further.